Are you looking for a way to add an element of design to a preexisting fireplace shelf, fireplace mantel, or kitchen bar? If so, Castle Design has a large selection of corbels and brackets that will allow you to do just that. Our corbels and brackets allow you to create a beautiful expression in your home. Add a decorative architectural design with wall accents by using corbels and brackets. 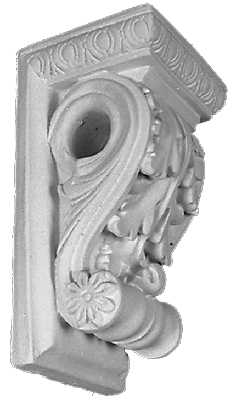 Our plaster corbels provide a highly detailed appearance that in many cases cannot be replicated by wooden or polyurethane architectural corbels or wood architectural brackets. The smooth gypsum finish of our decorative corbels and brackets is very accepting to most finishes and stains. As with all of our decorative architectural products, our brackets and corbels are 100% environmentally Green with a Class II Fire Rating that allows them to be fire resistant. Whether you are looking for a specific corbel design like an acanthus corbel or a corbel for a specific purpose like a shelf corbel, fireplace corbel, or bar corbel, we have over 65 corbel and bracket designs from which to select. Our portfolio contains many photos of installed corbels and brackets. Like all of our product, these are intended for interior use only, unless you contact us in advance and request a special exterior formulation. Our corbels and brackets range in size from under 16” to over 35”. We also have corbel drapery brackets. Our wide selection is sure to have the exact look and size to allow you to complete your project! At Castle Design we pride ourselves on impeccable customer service and look forward to working with you to insure that you are completely satisfied with your purchase. Please contact us if we can be of any assistance to you.